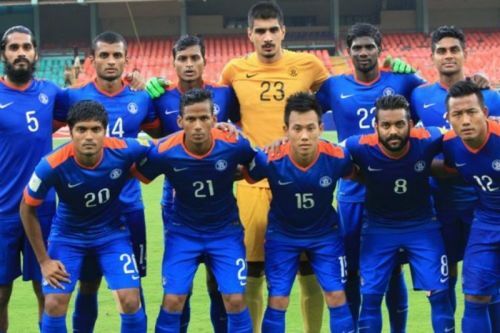 Asian Cup 2019: The Road to the Finals and where is India ranked among Asian nations? Asian Cup 2019 will be underway in UAE from January 5, 2019, till February 1, 2019, with the Indian national team part of the 24 nations that are contesting in the tournament. The 24 teams have been divided into 6 groups of 4 teams each and the top two teams of each group and the four best third-placed teams advance to the round of 16. Now let us look at where India ranks based on the latest FIFA rankings among these nations and what are the chances of India in the Asian Cup 2019. India has been drawn into Group A alongside the hosts UAE, Thailand, and Bahrain. What are the chances of India qualifying from this group? UAE is ranked 79th with 1309 FIFA rating points, ahead of India on 97th position. Thailand is ranked 118th with 1160 rating points and Bahrain is ranked 113th with 1178 rating points. To sum up, to go by the FIFA rankings, India will emerge second in the group and can qualify for the Round 16 as the second-best team in the group behind UAE. Once qualified as the Runner-up Group A, Indian national football team will have to meet the runner-up of Group C. As per the latest FIFA rankings, South Korea (53rd) and China Republic (76th ) will be the two teams that might qualify based on the hierarchy of FIFA rankings. In such a scenario, the Indian national team will have to meet China in the round-16 knockout match on January 20, 2019. India has the advantage of having played an international friendly against China recently and being able to hold them to a draw. Now for the sake of the discussion let us assume that India beats China in the Round-16 Knockout match and qualify for the quarterfinals. In the Quarterfinals, in all the probability, the Indian team will have to meet the winner of Group D. Interestingly Group D has the highest ranked AFC nation, Iran. Iran is ranked 29th in the FIFA rankings and it is quite difficult at this stage to fathom Indian national team beating Iran. But a good show on the ground to hold them off from scoring may increase the probability. Again for the sake of discussion, let us assume India do beat Iran (maybe in the penalty shootouts) in the Quarterfinals and qualified to the semifinals. In the Semifinals, India might have to face either 41st ranked Australia or 50th ranked Japan. Either scenario doesn't hold many smiles on the faces of Indian fans. And if India reaches the finals, India might have to face either 53rd ranked South Korea or 69th ranked Saudi Arabia. To sum up, the road to the finals of the Asian Cup 2019 for India is not promising on this path. Let us now try to evaluate an alternate scenario wherein India tops the group A ahead of Saudi Arabia. In such a situation, India will have to face one of the third-placed teams in either Groups C/D/E, which looks better considering the chances of India qualifying to Quarterfinals. 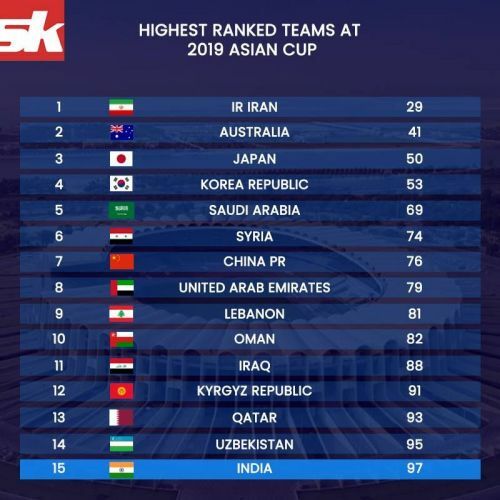 In the quarterfinals, India might have to face either 74th ranked Syria or the 95th ranked Uzbekistan which again is much better looking for India's prospects considering the other scenario where India had to face Iran. In the semifinals, it is going to be either 53rd ranked South Korea or 69th ranked Saudi Arabia. Again much better chances than facing Australia or Japan in the semifinals. But then it is going to be either Iran/Australia/Japan that India will have to face in the Finals of Asian Cup 2019. This route is much more promising than India proceeding forward while being second in the group stage. The chances of India proceeding as one of the 4 third-placed teams is even less likely as the third-placed teams will have to face either Australia or South Korea in the Quarterfinals stage itself. All the wishful thinking aside, Indian national football team ranking 97th in the FIFA rankings, is ranked 15th among the 24 nations participating in the tournament. Let's hope the Blue Tigers will try to put out a good show and will top the Group A ahead of the hosts UAE and go a long way in the Asian Cup 2019.